It's loaded with mini banners, made from dictionary sheets, strung onto jute. I wrote the words 'Peace', 'Hope' and 'Joy' right onto the dictionary paper. See those white balls with the polka dots? They didn't come that way. 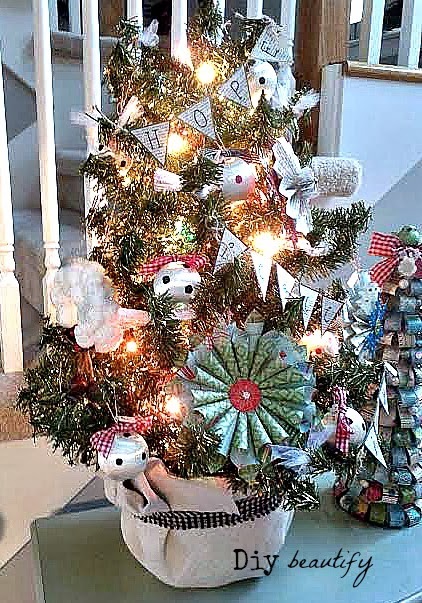 I found the vintage floss ornaments at Goodwill and hand-painted the dots onto them, then added the bows. Red dots with black-checked bows and black dots with red-checked bows. I love how they turned out! Guess where I hung them to dry? My chandelier! Yup, I untwisted a paperclip to make a hanger and hung one on each arm of my chandelier overnight to dry. It was the perfect place! 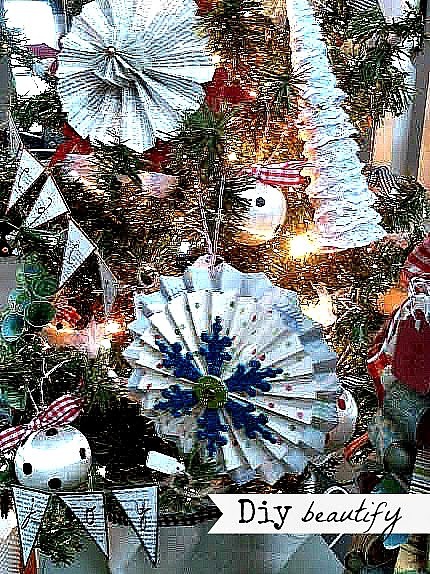 More dictionary paper was used to create these folded paper medallions. This one is mounted on a giant red glittered snowflake and has a gold pearl center. 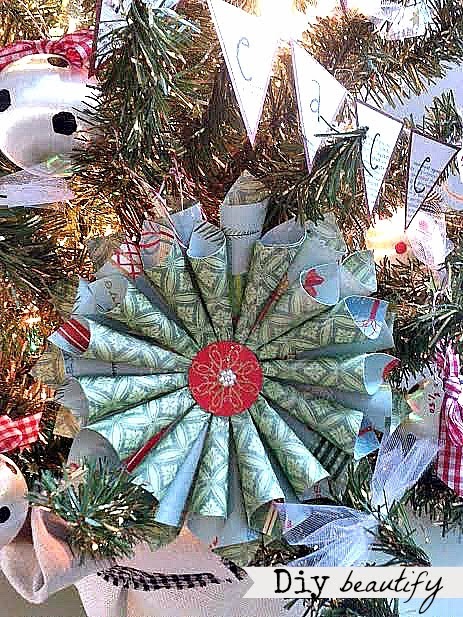 This ornament was created used double-sided glittered Christmas paper. Lots and lots of mini paper rolls were made and glued into place. And then another layer was added so that it would be extra full. 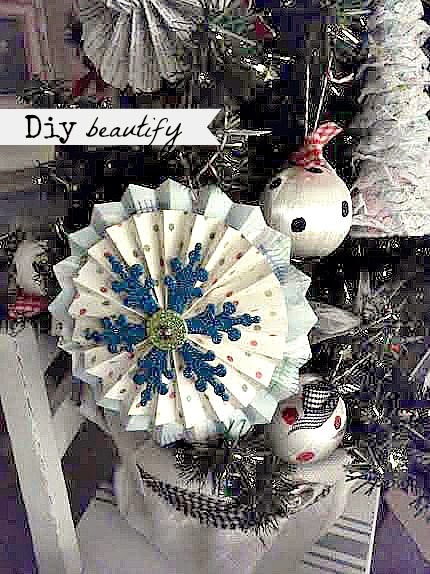 A glittered chipboard circle makes a pretty center, especially with the little pearled flower. 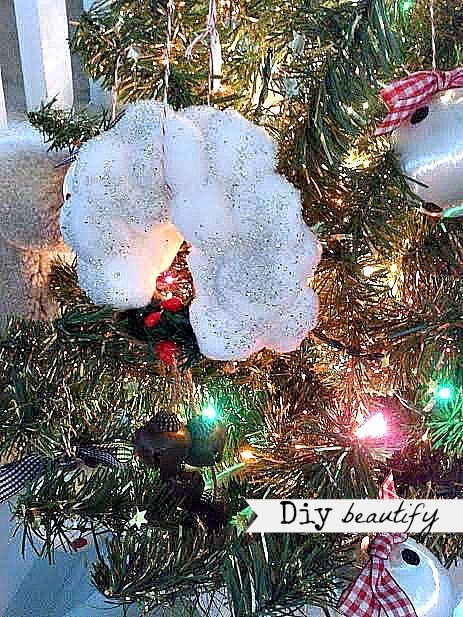 This glittered snowball wreath was made using cotton balls and lots of glitter! It was added to an existing ornament that needed some sprucing up! Now it looks much more festive and ready for SNOW! The jingle bells are part of this ornament and hang from it (it's hard to tell in the picture). Here's another folded paper medallion. I love the bright blue snowflake with the lime green center. It's so bright and cheerful. 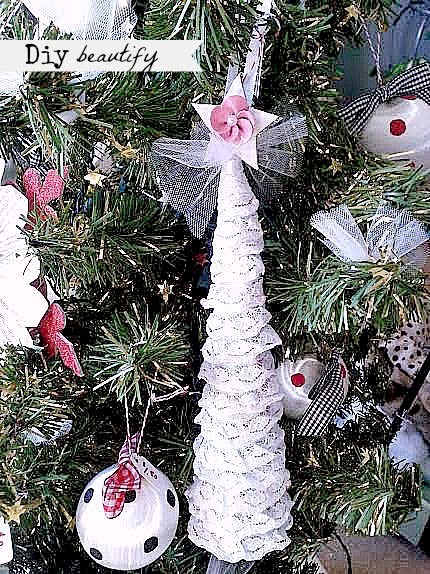 The last ornament I have to show you is the cutest mini lace tree, very shabby chic. Lace ribbon was glued around and around a tiny cardboard cone. I covered a chipboard star with pale pink gingham paper (you can't see it in the picture) and glittered the edges of the star with silver glitter. A tulle bow and pink leather flower finishes it off. In fact, I have used touches of tulle around the tree. I just tied small pieces of it around the ends of branches. It adds such softness and looks really pretty when the lights are on. The tree is sitting in a plastic bucket. I wrapped a large square of burlap around it and tied a strip of checked cloth around it to hold it in place. So there you have it. Lots of handmade ornaments for a miniature tree. If you have the time, you can save some dimes...how'd ya like that little ditty?? 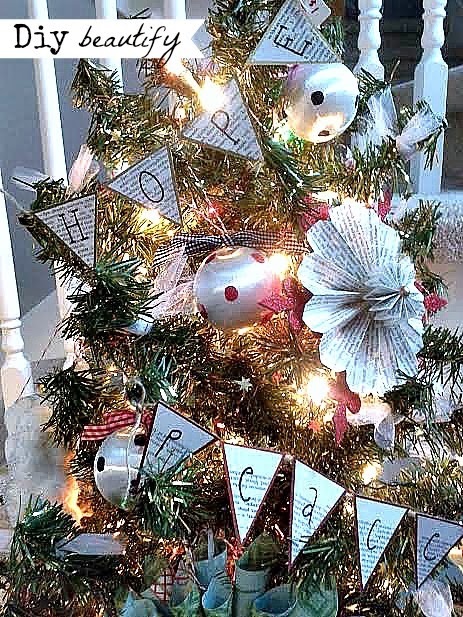 Hi Robin, so glad I could give you some additional ideas for your little tree! Have a great day! Your tree looks so pretty and personalised. I put my tree up on the weekend as well, now to buy and wrap the presents to put underneath it! This is adorable!!!! I'm pinning this one! Thanks for sharing another project on DIY Sunday Showcase. What sweet and unique ornaments you've created! I especially love the banner and paper ones. Thank you for sharing it at What We Accomplished Wednesdays. I appreciate your stopping by to leave such kind comments! Thank you :) Have a very Merry Christmas Deborah!! Hi Cindy! 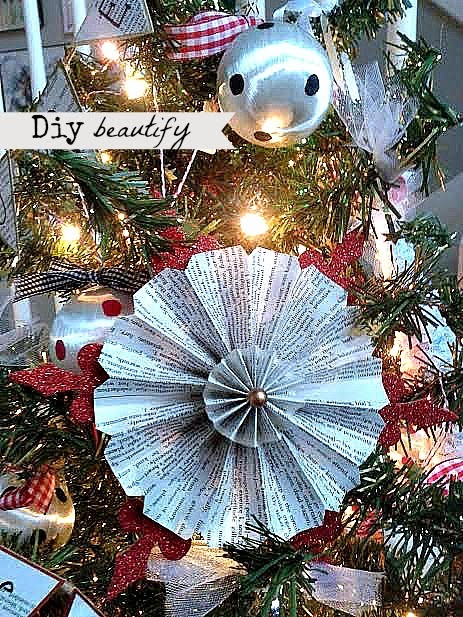 Love your tree and your book page ornament. I have a stack of books in our basement just waiting for a project like this! Thanks for sharing and congrats on your feature at House by Hoff yesterday! We're hosting a DIY ornament link party this week, and would love it if you stopped over. Happy Holidays!! Thank you for the sweetest comments and the Pin :) Merry Christmas!